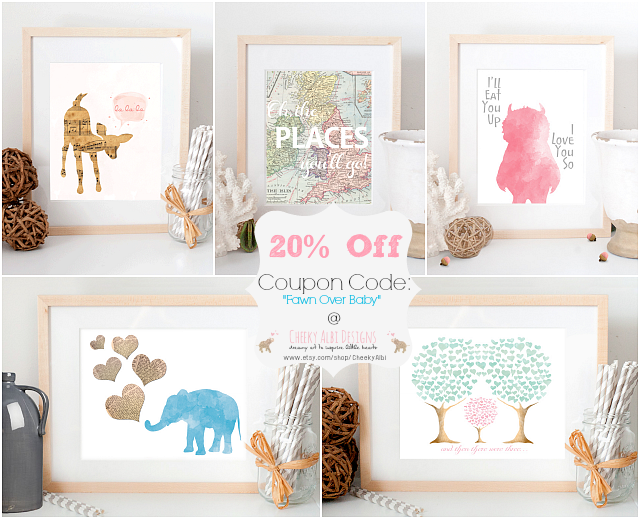 Fawn Over Baby: The Wonderful Cheeky Albi Designs: Print Review and Coupon Code! 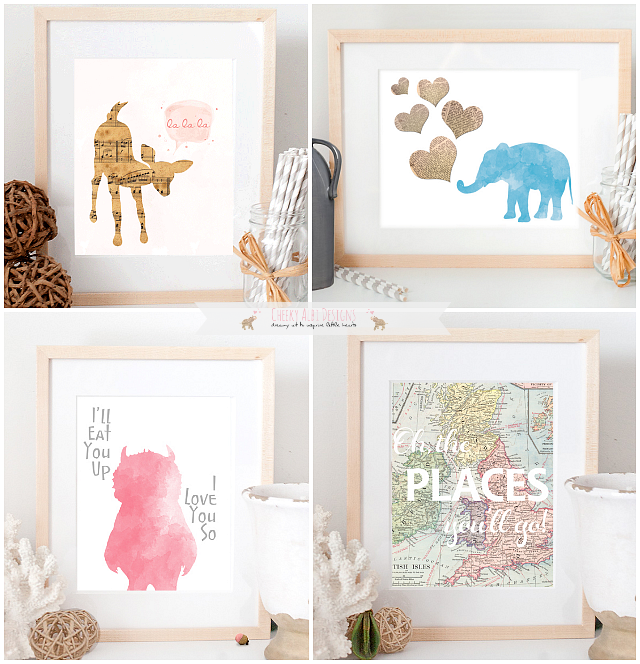 The Wonderful Cheeky Albi Designs: Print Review and Coupon Code! It's Friday!! I hope you have exciting plans for the weekend! 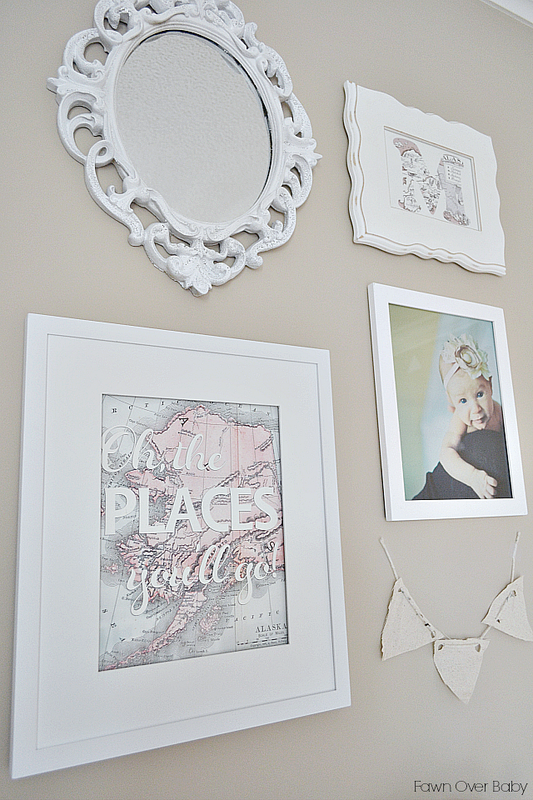 My exciting plans include finishing up the final touches to McKenzie's long awaited nursery update. I have had so much fun gathering a variety of fun little pieces that I hope will tie the room together nicely (fingers crossed). 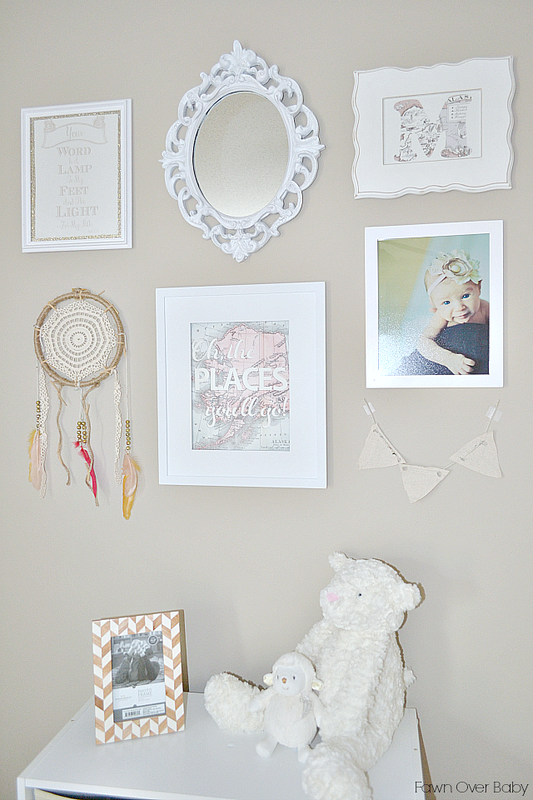 The project I have been working on this week is her mini collage wall display. 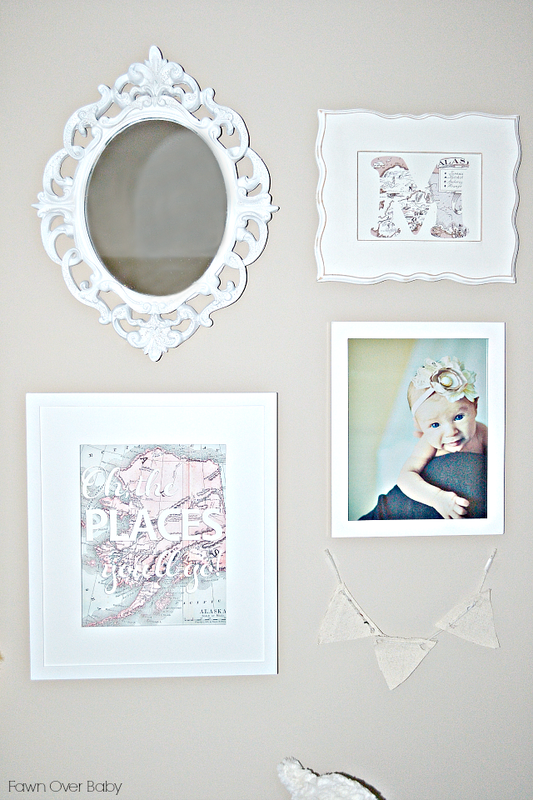 I decided to go with a collection of different shaped white frames to house a few fun prints that represent McKenzie. A fun fact about McKenzie is that she was born in Anchorage, Alaska and shares the same birth state as her grandma "mimi"(my mother). Who would have ever thought that two southern bread women, like my mom and I, would travel so far from home. Thanks to the US Air Force, we did and we will forever be proud of our stay there. I can't wait until McKenzie is old enough to understand and get to know the unique state that is Alaska. As a little reminder of where she was born, I wanted to incorporate Alaska in her room decor somehow. As I browsed Pinterest, I stumbled upon the most adorable print of a vintage map of the British Isles with the saying "Oh The Places You'll Go!" It was exactly what I was looking for to help round out the collage I was slowly putting together. If only I could switch out the beautiful british isles with a map of Alaska? I immediately contacted the wonderful Etsy shop that was behind this sweet little work of art, called Cheeky Albi Designs. 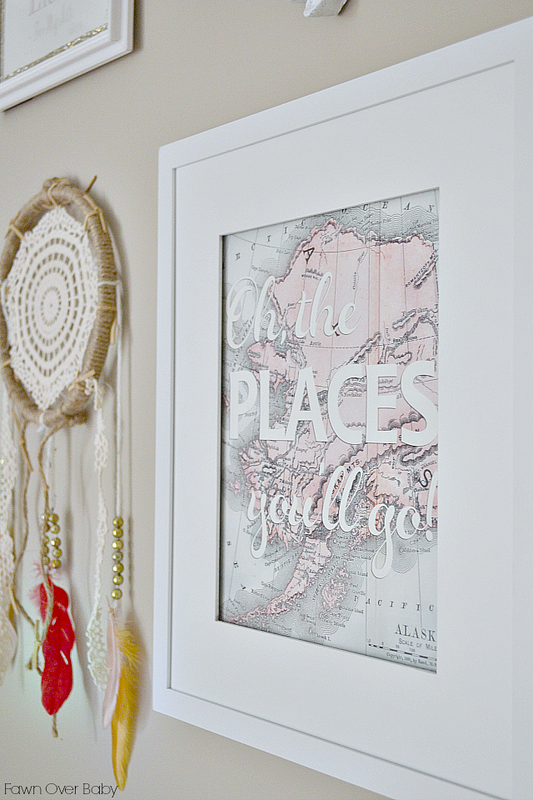 Owner and creator Lucia, granted my request and worked to find the perfect vintage map of Alaska as well as create the perfect color combo that would coordinate well with the overall color palette of McKenzie's room. I am always taken back when I come across shop owners that go out of their way to make sure their customers are 100% satisfied and that is exactly the service I received from the fabulous Lucia! Based out of Manhattan, NY, Cheeky Albi Designs "specializes in prints for nurseries and children's rooms". Each piece of art is created by Lucia herself and professionally printed on fine art paper with archival inks that will last nearly 100 years! This was so wonderful to learn, as I hope to keep these prints for many years to come. 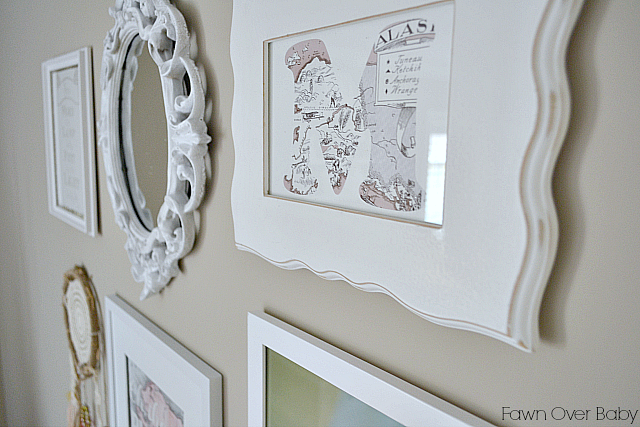 The Prints I chose for McKenzie's room was of course the Map Themed Print "Oh, the Places you'll go" and the "M" Initial in the vintage Alaska map design. I am so happy with how well they add a pop of color and interest to our wall display and create a daily reminder of McKenzie's Alaskan roots. To welcome all of you to Cheeky Albi Designs, Lucia is now offering Fawn Over Baby Readers a lovely coupon code to use toward your online purchase! Just type in code: "FawnOverBaby" at checkout and you will receive 20% off! How exciting is that!! I know you will love each and every print as much as I do! Enjoy and Have fun Cheeky Albi Shopping! So cute! Love the Where the Wild Things Are print!